I've started writing a diary. I've always been full of great intentions whenever I've bought one in the past. I remember to carry it with me for a few days, I enter a few half hearted musings and then... I change my bag du jour and the diary gets forgotten. 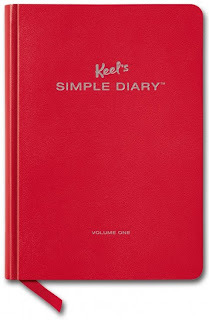 So I bought a Simple Diary (found via wishwishwish). It's much easier to write in than any other diary I've ever had as there are no blank pages staring back at you, waiting for you to fill them with angst or woe or happiness. Each page is filled with little quotes, prompts and questions to answer. You don't have to work through the book page by page, instead you can dip in and out of it... find a page that matches the kind of day you're having and scrawl away! I've written a little paragraph inside the front cover. A list of goals if you will. Today I started on a journey. It's going to be a long, hard journey. But I'll get there. I've never been more sure of anything.